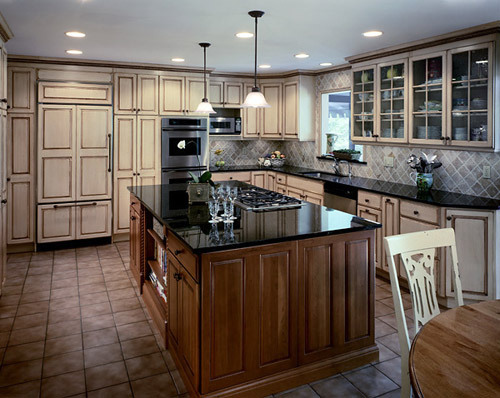 Our design team was put to work on this project when our clients requested a quick turnaround on this fully renovated kitchen, from start to finish, in just twenty-eight days. The center island is the perfect workspace for any chef, with access to stovetop burners, plenty of counter space to work on, and shelving for all of the homeowners cookbooks. The refrigerator and freezer blend in with panels and hardware that match the rest of the kitchen cabinetry allowing a clean, sleek look to sweep across the space.